Coinciding with Orgatec, Kriskadecor will present its new framed solutions: The Frame, Shape Frame and Boira Planter. All of them can function as a space divider or as merely decorative elements. In this way, the Catalan brand wants to provide interior designers with an alternative to create independent spaces and that workplaces cease to be gray and monotonous environments. Elegant and light structure that captures attention immediately and enhances the decoration of any space. This frame, of classic style, is intended to complete open spaces without insulation as would walls or partitions. As in all Kriskadecor products, it can be customized to the fullest to suit the characteristics of the place. Decorative perimeter frame that is placed when performing a chain emptying and that works as an entrance door. This new solution involves the area of passage without affecting the balance and space of the room and does not require complex works. In terms of design, the limit is in the imagination. The frame can reproduce all kinds of organic or geometric shapes, including completely closed figures suspended in the mesh. Kriskadecor and Hobby Flower have collaborated to create Boira Planter, a product that brings together the best of each company. It is a very versatile room divider given its condition of portable or mobile element. Also, one of the strengths of this new solution is the inclusion of plants that, among other things, improve the mood and reduce the stress of those around them. All these new solutions join the already well-known Barcelona Screen Divider, designed by Crea Product Design. The possibility of personalization in size, color and design, makes possible the integration of the screen in any space. Thanks to the density and spacing of the chains, light filters easily, creating warm and pleasant environments. For more information, take a look to Framed Solutions Catalogue. 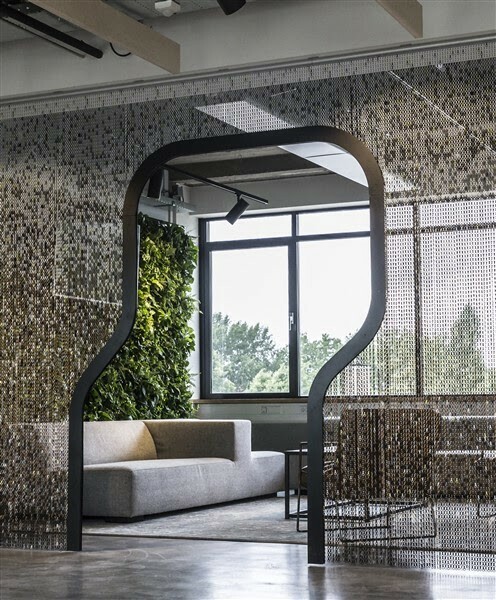 Photo credits: IPG Mediabrands project by Tétris Netherlands. Photo by Niels Kramer.